To start off, I will offer a disclaimer that I am not an Indigenous knowledge keeper, and I don’t have generations of knowledge behind me to teach and to share. But I am an Indigenous knowledge-seeker. And it is within my process of information gathering that I find myself and my connections. As I began to discover Indigenous beliefs in the sacredness of land, it is here that I found my place. I will attempt to share my ways of knowing, my ways of integrating my Indigenous and non-Indigenous worldviews. Within the purview of most worldviews, I think we can all agree that land brings us life. It is from nature that we get our food, water, clothing, shelter, transportation and warmth. Over time, humans have been able to create some of these necessary things in non-nature environments, but without the land we cannot manage all of these needs. What sets Indigenous views apart from this is the belief that land relations are bidirectional, meaning that in as much as we take from the land, we must also give back to maintain holistic balance. One of the biggest questions that tends to be asked is what this balance is and how we can strike it. First Nations people have centuries of knowledge of the land to which they have been connected and just as long studying the balance that occurs within the ecosystem. This knowledge, in itself, is a well-accepted form of scientific study different from western science. In this worldview, knowledge and the learner are interconnected. What this means is that the very act of learning can impact the knowledge. For example, an ecology student watching coyotes in their natural environment will have an impact on vegetation and the microsystems through which she walks. As a result, some Indigenous worldviews of the land tend to be very much about relationships. Can this knowledge be applied to human relationships? Can Indigenous ways of knowing be valued alongside non-Indigenous views? The answer is yes, if we honour and understand this bidirectional approach. Each worldview influences the other in a way that maintains balance. 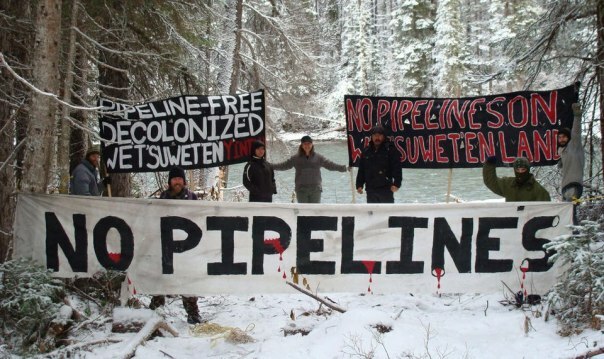 Recent events occurring on Wet’suwet’en land and in solidarity events across Turtle Island have ignited passions on all sides. It appears that at least two worldviews are in conflict: those who honour the bidirectional view of the land and those who are looking for the extraction of resources for profit and possibly survival in a particularly brutal and unforgiving economic system. In fact, this conflict in itself demonstrates how connected we all are, but in a way that does not promote balance. I urge us all to explore ways of looking for healing, while honouring both worldviews and very importantly, honouring reconciliation and the long term effects of the worldview responsible for colonialism. Just like plants connect to a geographical place, we are all connected to where we live, and to each other. To keep a balance within the world, the connection requires us to be bidirectional in our relationships with the living and with the land. You as the reader and me as the writer have now been connected through this writing. I present to you my knowledge, you read and absorb this offering, and I receive the gift of your audience. Next Post: Is Self-Care Too Much Work?